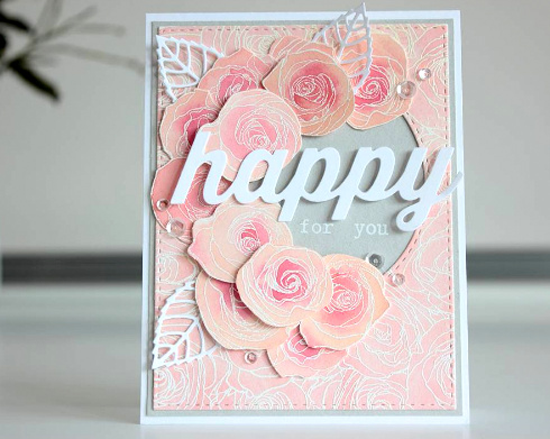 The Bundles of Blossoms Background stamp is showing off again in this beauty by thereisacardforthat found on Instagram. 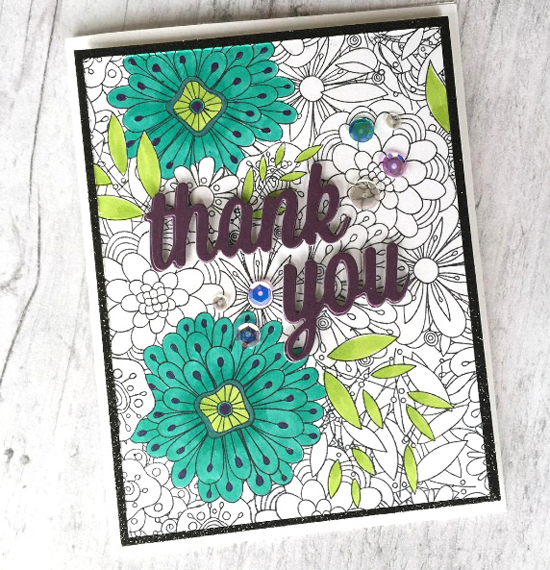 So pretty with the Thank You Die-namics and a few sequins! 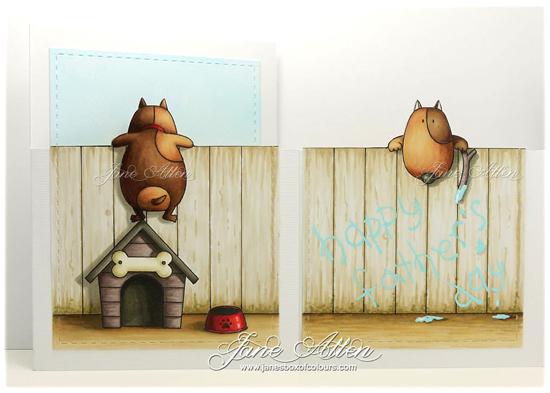 Creative Team Member Debbie Olson spotted Jane's card on her blog and exclaimed, "Oh, my word--this doggie card!" Jane makes some magic with the You Make My Tail Wag stamp set, her MISTI, and the Copic Airbrush. QUITE impressive! Clever Carol created quite a buzz in the My Favorite Things Challenge & Inspiration Facebook Group with this super ingenious card. 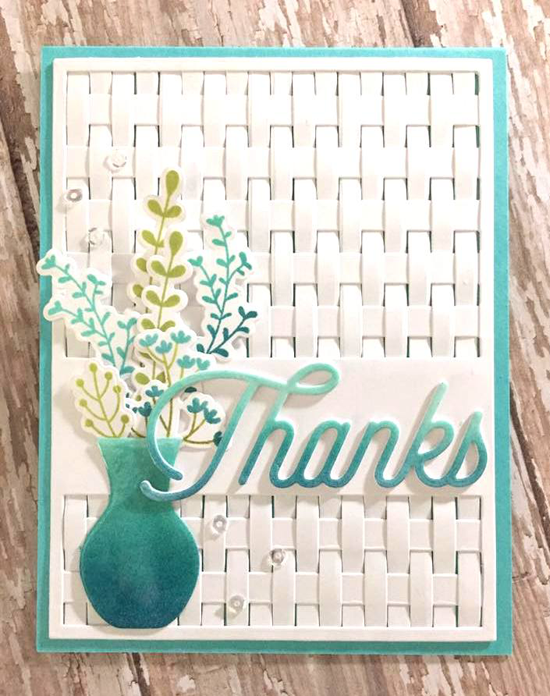 She cut the Striped Sentiment Strip Cover-Up Die-namics and wove the cut strips through to create the woven basket look on her background. Anja's card is simple and simply cute! Looks like our Fun in the Sun gal is sunning her buns in a most colorful and really cool way. I love how the circle makes it look like you're viewing her from the porthole of a ship. OK. Now that you've picked your jaw up off the floor, let's talk about this full on magnificent design from Amanda! Amanda loves the Roses All Over Background stamp, and says on her blog, "I have used the background stamp Roses All Over by MFT, but you can see that I didn't use it only for the background. Those roses are just too beautiful, and I had to bring them up front!" You can see more of how she created this card by watching the video on her blog HERE. Her addition of the Happy Duo and Layered Leaves Die-namics complete this gorgeous wedding card perfectly. Thanks for using MFT, ladies! You've left us inspired, and that's what it's all about! See you tomorrow for another great Sketch Challenge, and look for the next MFT Color Challenge this Thursday, July 14th. Which design is my favourite this week? Impossible to answer!! Each one is fabulous!! So many unique and wonderful ideas! Absolutely gorgeous cards!! The roses all Over card is spectacular! Totally honored to be spotted together with these talented card makers. Thank you so much!